VintageJeannie: don't be afraid. just ask! don't be afraid. just ask! I was raised to never yell or cause a row. I was so passive in elementary school that my mom said when I was little, if a kid tried to take my toys away from me, I'd hand them over gladly and grab something else to give to them too. Now, I realize that's all a bunch of baloney. Ladies. Let's wisen up, make a fuss, object, reject, argue, prove points, ask for things, demand them, even. That's the only way to get ahead in this world. And same goes for guys. I can't tell you how unattractive it is when a man is passive. Blech. I remember this one time I was at a free, outdoor concert with the Flaming Lips in San Diego. It was one of the worst experiences of my life, mostly because it was so damn crowded and nobody could see above one another's heads. There was a couple standing right in front of a fountain waiting for the show to start. A gaggle of drunkards ran up and stood on top of the fountain right in front of the guy and his girl. The guy was pissed. In a strong, low voice he said, "Get down." The drunkards pretended not to hear. "Get down. Get off the f-ing fountain." He wasn't even yelling, but he spoke firmly. Immediately all of us tensed up, but the guy did not relent. "Get down right now." You could tell the drunkards were pretty intimidated. One by one, they slunk off the fountain and moved on. It was great! Especially us asian folk, it's so important for us to prove we will not roll over and play dead. Like when some man kicked me on the street while I walked to work. I really wanted to just walk away and pretend it never happened, but I started yelling at him. I got in his face and was like, "Why the hell did you just kick me!!!!!RRRAWWRRR!!!!" lol. Kind of ridiculous but it worked. Also, I've learned that it never hurts to ask for things. Like my new earrings! 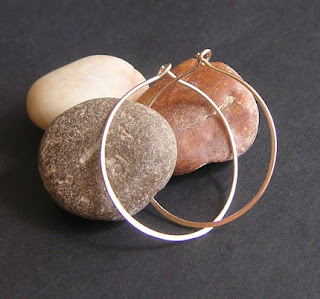 I've been looking for thin gold hoops for a while. These were perfect but I wanted them to be a little bigger and the jeweler will be making them next week. Check her out, she's great! the new place ... ROCKS!